For more than 60 years, Weeki Wachee Springs State Park has attracted visitors for the beautiful mermaids who swim in the cool 74 degree, sparkling clear spring waters. 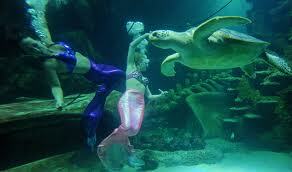 The famous mermaids offer 2 shows daily: The Little Mermaid and Fish Tails. Visitors can also enjoy the Riverboat Cruise and animal shows as well as Buccaneer Bay Water Park with flumes rides and lazy river. Canoe and kayaking is also available. So if you are traveling on the west coast of Florida, plan for a visit…..something the kids will surely enjoy!